Mots clés : Carte des orogènes du Monde. Construction et réactivation des orogènes successifs du Protérozoïque, Calédonien, Varisque et Alpin à l'échelle de 1/25 000 000. Chefs du projet : Manuel Pubellier, Fathiya Jamaludin, Andreína García Reyes, Christian Robert, Romain Bousquet. The first annual workshop was held in Paris, France, on 3-5 Dec, 2018, and was hosted by the CGMW and the Ecole Normale Supérieure. A group of 25 representatives from P.R of China, Malaysia, Iran, Russia, Venezuela, Germany, Turkey, France, as well as scientists from the universities of Taiwan and Hong Kong. The workshop was focused on designing the way of working and dispatching tasks, and also on shaping the legend. There were vivid scientific debates. Discussions also concerned funding possibilities, deliverables and next meetings. A slot was dedicated to the digital diffusion of the final product and openings for generating cross-sections through a multi-layered model. A short history of the project was presented and several examples of the available worldwide reconstructions performed in the past (which are not so many). An unfinished but very useful attempt of as similar map was performed by TOTAL a few years ago, which underlined the difficulties and proposed a legend. Some parts of this map may be useful for the project. Then discussions were mostly about the definition of an orogen; specifically what are the general characteristics and the differences. They were various presentations highlighting the duration of orogens, the way the erosion is responsible for unroofing the upper sections and exhumes the deep crustal and often metamorphosed units; thus implying the necessity to modify the legend as we go backward through time. The way the sutures should be represented was discussed; having in mind that they are expressed by small areas in the globe. However they may be larger if we include the whole oceanic assemblage including mafic/ultramafic as well as oceanic sedimentary series. Examples were shown in Turkey for the Alpine system and Western Europe for the Variscan orogen. The time frame was discussed noticing that some orogenic cycles can be very short (6My in Western Papua), or very long such as in the Early Paleozoic, and that these may actually include several short-lived events such as those observed in the Western Pacific or the Caribbean. Diachronism in the formation of the mountain ranges is observed depending on the width of the oceanic domain which has been subducted and the distance from the Euler pole. This reflects the diachronism well-documented in the opening of recent V-shaped marginal basins (SE Asia) and to a certain extent in the large ocean basins (Atlantic Ocean). This discussion led us toward 2 important aspects for the legend. 2 - The “V”-shape” basins invokes the existence of a propagator which marks the transition in time and structure of the basin from a basin which developed ocean floor spreading and an aborted graben devoid of ocean crust. This illustrates the fact that “intra-continental” orogens and “collisional orogens” may proceed from the same basins with a crustal variation along strike. The discussion of the time frame led to the importance in the project of the change of crustal construction or “consolidation” before and after plate tectonics sensu stricto; a boundary that may be placed around 2.5 billion years. This could be illustrated nicely in the early cratonized part of the continents. We agreed to try to represent it on the cratonic part of the map with a different and less eye-catching aspect. In the current discussions, the legend would involve different type of orogen: (i) the subduction orogen including ophiolites, metamorphism, magmatism and accretionary wedge, (ii) the collisional orogen including metamorphism, syn-collisional magmatism, molassic basin, nappes and (iii) the compression or intracontinental orogen. A reflection will also be made for ancient orogens when plate tectonics did not exist. As we go backward in time, the main elements could be simplified due to a lack of data, a lack of understanding, or a strong erosion, which unroofed the upper layers of the orogen. Large parts of the map such as the Central Asia Region are well mapped already and the type of data are not too difficult to adapt to the map project. This latter region appears complex on a cartographic representation, but this could reflect the “Southeast Asia” type of arc-continent collision and a smart legend could take into account such a type of orogen as a “subduction type” or “marginal basins shortening” type of orogen. We may try to include the case of the cordilleras into this box. The map is actually a very good candidate as a base map for a Metamorphic Map of the World. It could be a layer of the map project and the metamorphic facies could be represented as full circle on each orogens. The important magmatic bodies can be represented on the map. There was a discussion whether it is relevant to separate syn-tectonic and post tectonic which often have the same meaning or cannot be distinguished. Successor basins have actually a similar meaning in the front of the developing mountain ranges and to the back of the orogens on the upper plate. The active tectonics may be a separate representation to locate the present zones of deformation. It does not need to be as detailed as the upcoming Seismotectonic Map of the World of CGMW. We found out that there was potential for collaboration with IGCP662. We have contacted Dr WangTao; PI of the IGCP662; to explore the possibility of a joint workshop in the future. 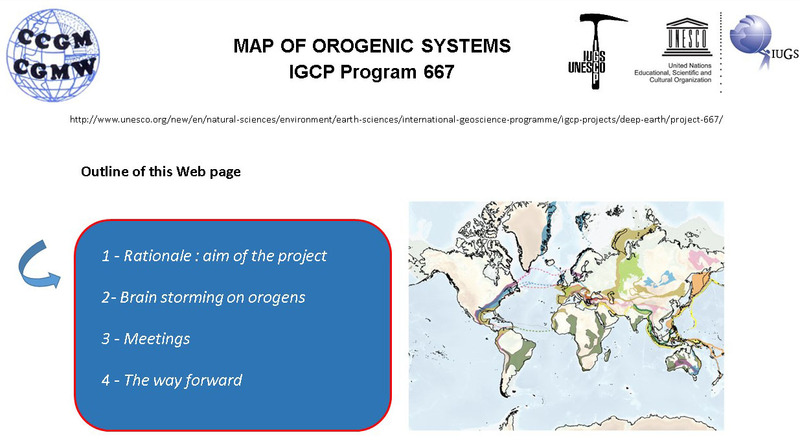 Some members of the IGCP667 participate already in that project. A time slot was dedicated to the digital diffusion of the final product and openings for generating cross-sections through a multi-layered model. An engineer from the VisioTerra development team came to specifically answer the questions of the group concerning the feasibility of the quick worldwide application of the results of the project (namely the display of the layers relative to each orogens). This is confirmed. We also discussed about the possibility of displaying deep envelopes on VtWeb. This is already operational. We therefore can represent the Moho as a surface and we will send the data (CRUST db) to VisioTerra. We also need to explore if a grid of the lower/upper crust is available. 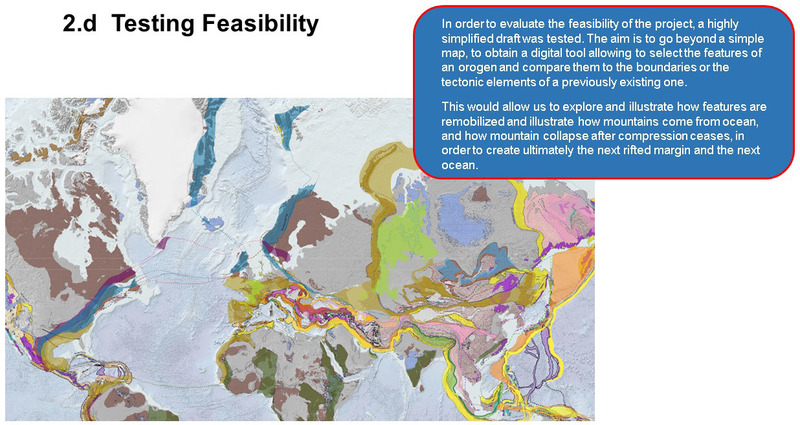 The critical aspect of the project is to try to represent wireframe of basic cross sections anywhere on the globe so that the users can construct their own geological sections, and teach geosciences using this tool. This is under development and already works on simple multilayered surfaces. It has been decided to launch a forum on ResearchGate to collect the various opinions on the definition worldwide. We will then write the sketch of a paper in “Episodes” concerning the result of the discussion concerning the definition and major characteristics of an orogen.